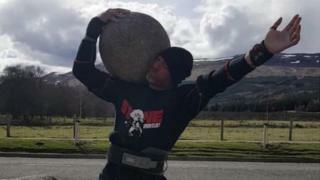 A former TV star has smashed the record for lifting the famous Dinnie Stones. James Crossley, who was Hunter in the 90s television series Gladiators, made it his life's focus for four months to beat the previous record of holding the stones for 33.9 seconds. After two failed attempts, the weightlifter and strongman summoned all his strength to lift the two giant rocks at the Old Potarch Hotel in Aberdeenshire. His 34.58 seconds set a new record. "Since I was 12, I was obsessed with different challenges," said James. "When I hit 40 four years ago I wanted to set myself a goal of having a world record. "I discovered historic stone tours of Scotland and then I came across these Dinnie Stones. "The history there was incredible." James found a gym an hour away from his home in London which had replica stones. The first time he lifted them, he managed five seconds. He told the BBC Scotland news website: "I asked the trainer, did he think I could get there to the world record of 33.9? "He joked that I might, if I made it my total life commitment. "So basically my whole life for four months has revolved around these Dinnie Stones. "I wake up thinking about Dinnie Stones, I go to bed thinking about Dinnie Stones." What are the Dinnie Stones? The Dinnie Stones are two giant boulders which sit outside the Old Potarch Hotel between Aboyne and Banchory in Aberdeenshire. The smaller stone weighs 144.47kg (318.5lbs) and the larger 188.02kg (414.5lbs). Legendary Scottish strongman Donald Dinnie achieved international fame from his exploits around the world. In 1860 Donald Dinnie famously carried them both with his bare hands across the width of nearby Potarch Bridge - a distance of more than 17ft (5m). James said lifting the stones is not about how strong the grip is, but is about pain management when holding that kind of weight for so long. During training, his weights got heavier, he held them for longer, working on his grip and practising yoga for pain management and breathing techniques. On Saturday 28 April, James travelled to Aberdeenshire, but he did not make it easy on himself. The first of three permitted attempts just fell short at 31 seconds. After a rest, a second try ended in 30.3 seconds. James said: "My hands were torn and I thought I had peaked. I had one more go. I thought maybe I should leave it. I started to get the feeling back in my hands, I listened to the Rocky soundtrack in my ears and I just went for it. "I got 34.58 seconds on the third lift.
" I looked at the timekeepers and I burst into tears as soon as I knew I'd done it." One of the organisers of the challenge, Steve Shanks said: "The lift and hold for time aspect was introduced at the Aboyne Highland games in August 2016. "It is not strictly speaking in keeping with the original historical challenge laid down by Donald Dinnie in 1860, however it is definitely becoming more popular amongst strength athletes and James' incredible lift is the longest recorded to date."